Get away from the crowds in the Cradle Mountain – Lake St Clair National Park? 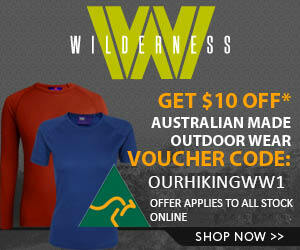 Enjoy a great 7 to 8 day hiking trip in some spectacular Tasmanian Wilderness with some luxury accommodation at the end? 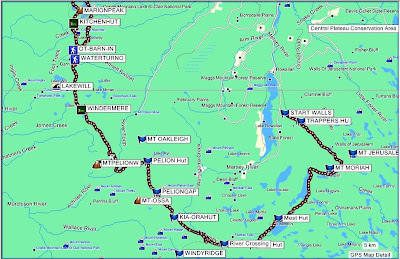 We leave tomorrow to walk from the Walls of Jerusalem to Lake Adelaide, Junction Hut, across the Never Never and then onto the Overland Track. We join the Overland Track at Hartnett Falls and then head north to Pelion Hut, Windemere and Scott Kilvett Hut. 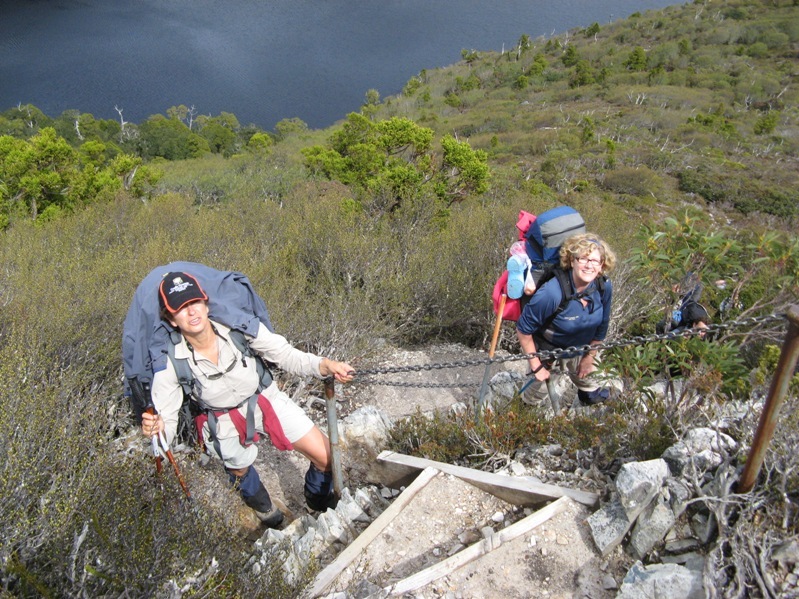 This walk is a great way to enjoy some time away from the sometimes busy Overland Track, get into some “off track” bushwalking and combine the beautiful Walls of Jerusalem area with , what we believe, is the best end of the Overland Track – the north to Cradle Mountain. We did this same walk in July last year and really enjoyed the snow and fantastic scenery. This time, longer days and warmer weather, should also give us all a great experience. Please note: During the booking season (October 1 to May 31) walkers must walk north to south. The route on this map is only suitable for out-of-season walks. There will be six in the party Sue, Frank and Tom on his first Tassie hike. Colin, Alex and Paul make up the rest of the group. Paul and Alex have not hiked in Tasmania but have in New Zealand. This trip is planned to be quite leisurely with the maximum day around 15km. The whole trip will be about 84 km and we plan to be out 7 nights. The logistics are very similar to planning the Overland Track and many of the principals we applied to meal planning, transport, clothing and our gear list are straight out of our Planning the Overland Track downloadable eBook. Remember, this trip is NOT a substitute for walking the whole Overland Track, end to end, and should only be completed by bushwalkers who are experienced in Tasmanian conditions. Hello Frank & Sue. Thank you for your excellent blog. We are experienced walkers in Tassie, and have done the Overland track in summer.We also ski tour in winter through Vic & NSW. We intend to do the O/land track in winter [August this year] and wondered if you had any advise about if snow shoes are needed? I noted in your photos that the snow was not deep, except on the high peaks. Yet I have also read on a commercial trekking company website that they provide snow shoes for their clients. I feel comfortable with our equipment level, and fitness. I suppose it depends on the season – can you provide any insight? Arrgh!! What a hard question! We were there in September last year and had all organised snow shoes before we started the walk. We took them up to Ronney Creek and then I (Frank) ended up being the only one taking them. If you check out this post you will see a few pictures of the snow conditions. They were soft and slushy and the snow shoes (Yowies) were not too helpful as I kept breaking right through the snow to ground. Then it was a huge effort to drag them out of the snow. The others struggled but just took their time. It was one of those middle of the road conditions. – probably most importantly, keep an eye on Bushwalk Tasmania as the information there is very up to date and they are serious about sharing info and peoples safety. In retrospect I would not have taken them BUT would have been very , very happy to have them if there had been a huge dump. Glad you enjoyed reading the blog, and hope you took the time to subscribe. We are always putting up new stuff.